Type 2 diabetes? High cholesterol? Or both? 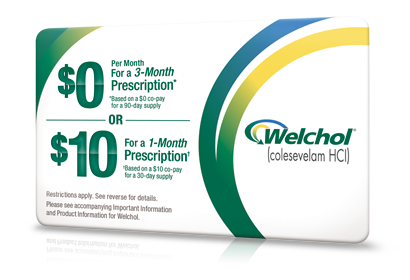 Welchol, along with diet and exercise, is the only FDA-approved medicine with a single active ingredient proven to lower both high blood sugar (A1C) and LDL-C or “bad” cholesterol in adults with type 2 diabetes and high cholesterol. Welchol has not been shown to prevent heart disease, heart attacks, stroke, or any of the above risks. 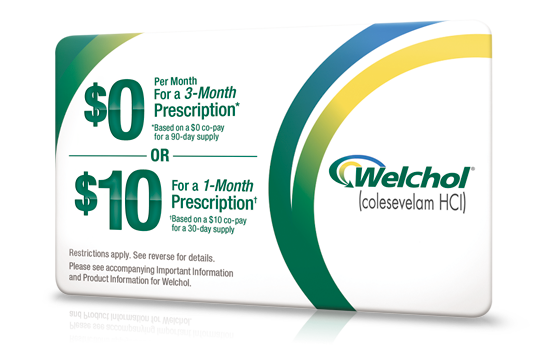 Please see "What is Welchol® (colesevelam HCl)" and "Important Safety Information about Welchol" below. Remember to talk to your healthcare provider before making any changes to your diet or exercise plan. Our bodies use cholesterol to make hormones, Vitamin D, and substances that help us digest foods. It's important to have the right balance of the different types of cholesterol in our bodies. If there is too much LDL-C or "bad" cholesterol in your arteries, it can be called high cholesterol. If you have too much "bad" cholesterol, it's important to work with your doctor to lower these levels to reach your target goal. Controlling your level of "bad" cholesterol is important. High levels of "bad" cholesterol may cause heart disease. "Bad" cholesterol builds up on the walls of the blood vessels over time. The blood vessels then become narrow. This may happen to the blood vessels going to the heart and brain. The result may be a heart attack, angina, stroke, or other diseases. Welchol has not been shown to prevent heart disease, heart attacks, or any other of the above conditions. 1. American Diabetes Association. Facts About Type 2. http://www.diabetes.org/diabetes-basics/type-2/factsabout-type-2.html. Updated October 27, 2015. Accessed March 9, 2018. 2. Centers for Disease Control and Prevention. National Diabetes Statistics Report: Estimates of Diabetes and Its Burden in the United States, 2017. Atlanta, GA: U.S. Department of Health and Human Services; 2017. https://www.cdc.gov/diabetes/pdfs/data/statistics/national-diabetes-statistics-report.pdf. Accessed March 9, 2018. 3. American Society for Metabolic and Bariatric Surgery. Type 2 Diabetes and Obesity: Twin Epidemics. https://asmbs.org/resources/weight-and-type-2-diabetes-after-bariatric-surgery-fact-sheet. Published November 2013. Accessed March 9, 2018. 4. American Diabetes Association. Diabetes Symptoms. http://www.diabetes.org/diabetesbasics/symptoms/. Updated June 1, 2015. Accessed March 9, 2018. 5. American Diabetes Association. Complications. http://www.diabetes.org/living-with-diabetes/complications/. Accessed March 9, 2018. 6. American Diabetes Association. Checking Your Blood Glucose. http://www.diabetes.org/living-with-diabetes/treatment-and-care/blood-glucose-control/checking-your-blood-glucose.html. Updated February 7, 2018. Accessed March 9, 2018. 7. American Diabetes Association. Standards of Medical Care in Diabetes - 2017: Glycemic targets, section 6. Diabetes Care 2017;40(Suppl 1):S48-S56. http://care.diabetesjournals.org/content/40/Supplement_1/S48. Accessed March 9, 2018. 8. American Diabetes Association. Standards of Medical Care in Diabetes - 2018; Diabetes Management Guidelines/Glycemic Targets. Diabetes Care 2018;41(Suppl 1):S1-S159. http://care.diabetesjournals.org/content/41/Supplement_1. Updated January 2016. Accessed March 9, 2018. 9. American Diabetes Association. A1C and eAG. http://www.diabetes.org/living-with-diabetes/treatment-and-care/blood-glucose-control/a1c/. Updated September 29, 2014. Accessed March 9, 2018. 10. American Diabetes Association. Taking Care of Your Diabetes. http://www.diabetes.org/living-with-diabetes/recently-diagnosed/where-do-i-begin/taking-care-of-your-diabetes.html. Accessed March 9, 2018. 11. National Institutes of Health: National Heart, Lung, and Blood Institute. High Blood Cholesterol. https://www.nhlbi.nih.gov/health-topics/high-bloodcholesterol. Accessed March 9, 2018. 12. American Heart Association. Prevention and Treatment of High Cholesterol. http://www.heart.org/HEARTORG/Conditions/Cholesterol/PreventionTreatmentofHighCholesterol/Prevention-and-Treatment-of-High-Cholesterol_UCM_001215_Article.jsp. Updated April 2017. Accessed March 9, 2018.